Ben Brantley is a jerk! Oh, I am sorry. That was a moment of Tourette’s for me. If you are not familiar with the name, he is unarguably the most important theater critic in America and writes for the New York Times. He is a much better writer than I. And for years, I have used him as a compass, a guiding star as to what to see when I go to New York City. I admire him and his reviews are usually accurate. To be narcissistically accurate, I admire usually because he agrees with me, and I with him. I apologize for name-calling, Ben! Maybe, I found my Trump-like evil side. But you are wrong about the wonderful musical Aida. When it opened, he had issues with the musical, with the huge exception of Heather Headley in the title role. He did feel that she was amazing and worth the price of the ticket. But local Music Mountain Theatre has mounted a lovely production of the show and, to my mind, has blown Brantley’s premise of a weak book out of the water. It also features incredible performances and, again, a star turn in the title role. “Aida” the musical is based on “Aida” the opera by Giuseppe Verdi. There are some changes in the book, but for all practical purposes, it is the same. Egypt is at war with Nubia. In the opera, it was specifically Ethiopia. This change is significant, as Nubia is more general. By being less specific, it makes the mind focus on race more and makes the story more contemporary. The story starts in the Egyptian wing of a museum, where the statue of the female Pharaoh Amneris (Jennifer Fisher) comes to life in front of two people, who connect with each other in front of this statue. 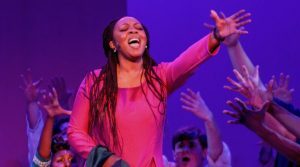 Pharaoh Amneris sings “Every Story is a Love Story,” and transports them back to ancient Egypt, where the story of “Aida” will be told. Amneris is the daughter of the Pharaoh (Kasey Ivan), who is waging war on Nubia. Her betrothed is Radames (Karl Weigand), a captain in the army who is returning from war. His men have captured Nubian women, who are earmarked to go to work in the copper mines. One of them tries to escape, her name is Aida and she captures the eye of Radames. Because of that attraction, he sends the women to work on the palace grounds and has Aida sent to his fiancée, Amneris, to be her handmaiden. The more he sees of Aida, the more she captures his heart and mind. The problem is that he has known the princess Amneris since childhood and, when they become married, he would become Pharaoh. His father, Zoser, is Egypt’s chief minister. As he is eager for his son to be married and ascend the throne, he is slowly poisoning the Pharaoh to get him there sooner rather than later. When Aida is taken to her mistress Princess Amneris by Radames’ Nubian slave Mereb, he recognizes Aida as the Princess of Nubia, daughter of Amonasro (Tim Chastain). Aida swears Mereb to secrecy. 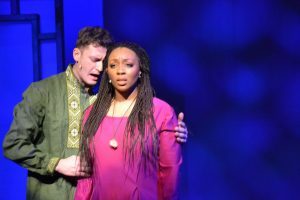 To find out what happens next, you will have to buy a ticket to Music Mountain’s “Aida.” Suffice it to say, Radames wants to be with Aida but, under present circumstances, it would seem to be impossible. The credentials of the show are impressive. Music is by Elton John and lyrics by Tim Rice (“Jesus Christ Superstar”). The book was adapted by Linda Woolverton (“Beauty and the Beast”), Robert Falls (director of the original production of “Aida” on Broadway) and David Henry Hwang (M Butterfly). The story line is dramatic and demands strong acting. If that is not there, it gets derailed. It also has a pop score whose demands are different than what might be required from what would be described as Broadway legit voices. I cannot urge you strongly enough to go and see this show, if for nothing else but to hear and see Siiyara Nelson as Aida. She fills the stage. She tears it apart. At the Nubian Slave camp, along with her slave friend Nehebka (Tia Brown) and the Nubian tribe, it is like being at Church. The song “The Gods Love Nubia” rings from the rafters. As slaves, singing out with joy, it might as well be “Black Lives Matter, “ because they do — and this song does. It takes you up, and you know in your soul the joy and hope that people have who believe. Wonderful song and a great way to end the first act. Now back to Nelson’s voice which is a gift anyone should be glad to be on the receiving end of. She sings from the soul with nuance and grace. 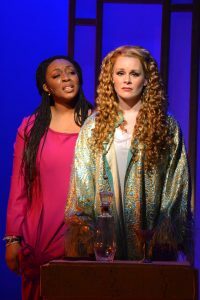 Whether singing “The Past is Another Land” or “Easy as Life” or in duets with Radames with “Elaborate Lives,” “Enchantment Passing Through” and “Written in the Stars,” she is amazing and knocks it out of the park each time. Karl Weigand is one of Music Mountain’s best actors. His memorable performances as Judd in “Oklahoma” and Paul in “Chorus Line” were thoughtful, moving and exceptional. The expectation that he would be on the money as Radames is fulfilled. I did not see Adam Pascal as Radames in the Broadway original, but I would venture to say that acting wise, you will be more satisfied with Weigand. I am saying this after viewing clips on YouTube, but this character has a problem as written. The songs are beautiful, but are so soulful and so in Elton John’s voice, if sung as written like Pascal did, then he does not seem like a soldier. Pascal seemed more like a man-boy. Conversely, Weigand sang well and very much as his character, but musically, if he sang in more of a pop style, it would have been more as the song demanded. But, paradoxically, it may have been going against character. I totally believed he loved Aida. He was a soldier. He was conflicted by his allegiance to his country and his love for Aida. The solution is difficult. A fine needle to thread. This is not a criticism, so much as an observation. This show and his performance and the entire production is so good, that it can stand it. (Also, he did set construction, which is also amazing. There is very little that Wiegand can’t do). 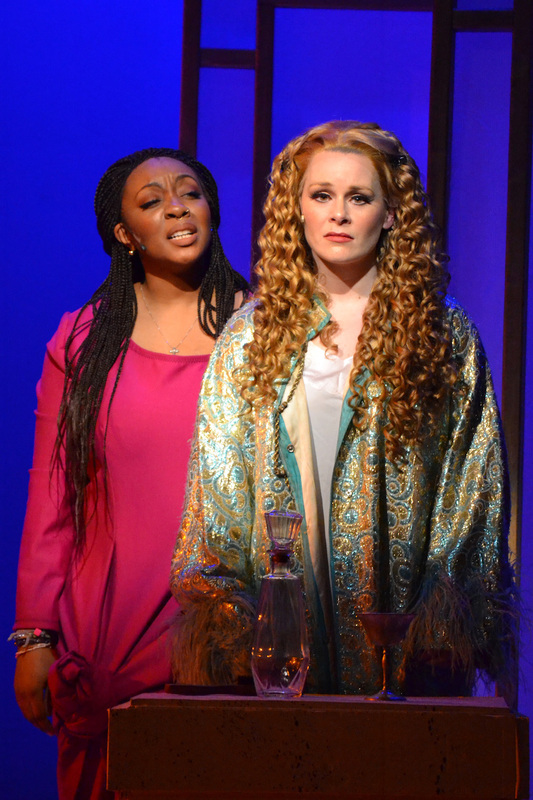 Jennifer Fisher as Amneris: Wow! An amazing voice and a fine actress who can go from needed comic moments in songs like “My Strongest Suit” to the dramatic “I Know the Truth” and “Every Story is a Love Story.” She can make you laugh and then cry and then, at the end, see that women can be strong leaders and have calls to duty. A wonderful performance. The talented Blair Johnson sang and danced his villainous best as Zoser, Radames’ father and the villain of the piece. 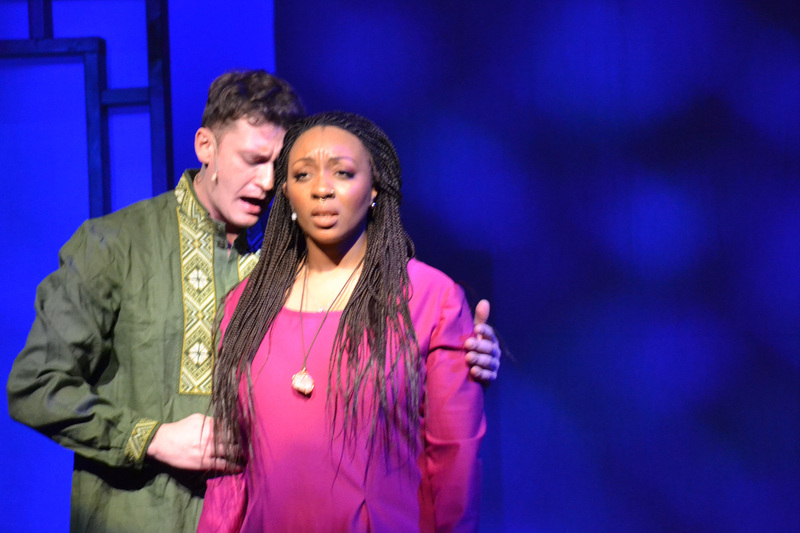 Shan Williams II as Mereb is a wonderful singer and the comic moment of the show as Mereb, a loyal servant and friend to Radames but a proud Nubian, as well. Williams is a pyramid full of charm and a delight, whenever on stage. Tim Chastain was strong as Aida’s father, King Amonasaro. His interactions with his daughter were one of the dramatic highlights of the show. The choreography by Valeen Williams was amazing. There was a lot of dance and it was truly lovely and an integral part of the show. She pushed the boundaries of actors who move well, and utilized stronger dancer’s abilities, like Sharon Rudda and Tyree Taylor. I should just leave a permanent compliment on “Word” on my computer for Jordan Brennan. The costumes in the museum were flawless. For the song “My Strongest Suit,” the dresses were designer worthy and over-the-top fabulous. He is the best go-to person to make miracles happen when it comes to costume and costume design. This is a show you should see. Louis Palena, the director, no doubt is proud. He should be. But what makes a show are all the people who contribute. Like a pyramid, each stone forms the foundation and bears the next layer. And layer upon layer of excellence is seen here. And, at the top, are the three excellent performances of Wiegand (Radames), Fisher (Amneris) and Nelson (Aida). 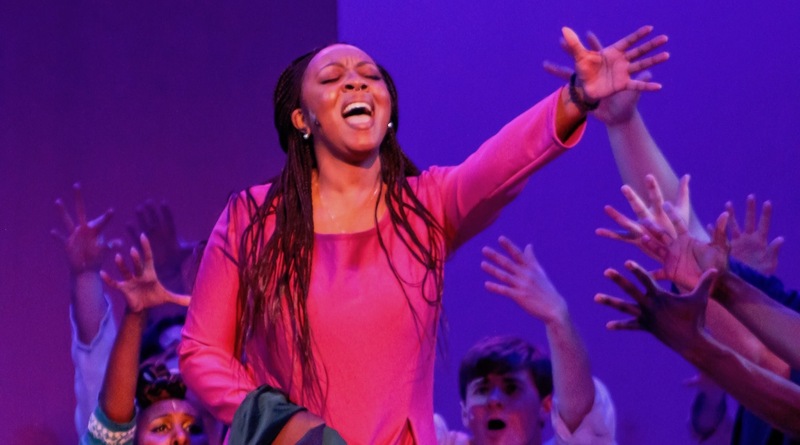 When Siiyara Nelson came out for curtain call, the entire audience was on its feet. There was so much hooting and hollering, it may have awoken a few mummies. I hope it wakes you up and gets you to go to Music Mountain Theatre online to buy tickets. The show continues through Feb. 17.